2 What is datacore farming? 3 How do I start to farm datacores? You may hear from some old timers about how datacore farming is no longer worth it. Datacore farming was changed several expansions ago but you may still hear information that it's now "bad". In an interview with Ten Ton Hammer posted 25 March 2012, CCP Soundwave indicated that he would like to phase out datacore farming, so the future viability of this passive source of income is uncertain. Given this is August 2015 datacore farming has remained but in it's less lucrative form. In a devblog  dated 9 May 2012 CCP Ytterbium stated "... our current intention is to turn datacore gathering into more of an active profession than it currently is..."
Due to the addition of datacores to Faction Warfare and the increased 10,000 ISK cost per datacore, datacore farming is no longer a very profitable source of passive income. One of the most interesting ways to earn InterStellar Kredits (ISK), the currency in EVE, is to develop relationships with research and development (R&D) agents in non-player corporations. Once you have access to R&D agents, you can then ask them to conduct research for you on your behalf. They will produce Research Points (RPs), which you can then use to purchase datacores. Datacores are a key part of the invention process in EVE, which produces advanced technology ("Tech II" or "T2") items. Datacores are a consumable item used in invention to create T2 Blueprint copies (also known as "BPCs"). Every invention process requires a certain amount of datacores, so datacores are always in demand. Datacores are therefore very valuable, and can be sold on the market for ISK, in addition to being used for T2 item production. This is a very good thing, as it means that "datacore farming", once established, can produce a passive income for EVE players. Without any further action required, an R&D agent will happily generate RPs, which you can periodically convert to income. With the relevant science skill, and Negotiation and Connections, to V, and using the full 6 agents (assuming Research Project Management at V), one can expect a monthly income in the region of 25-35 million ISK. This is a large drop from old earnings of up to 100 million ISK per month. Still, it may be possible to train multiple characters on the same account to access R&D agents, with the main obstacle being reaching the required standings levels on characters not yet trained for combat missions. Most players should expect to train all the required skills in one or two months (the estimated time to train Research Project Management to V and one science skill to IV is 44 days). Meanwhile, you can run missions to get to the required level of standings to unlock the higher-grade agents. So, in less than a couple of months in game time, you can establish a reliable semi-passive income stream that will last forever after in EVE. How do I start to farm datacores? Reach the required standings with R&D agents or corporations. Talk to the agent (in person - remote conversation will not work) to initiate research. Different R&D agents specialize in different types of research. They won't even speak to you unless you have the above skills trained and completed, and then they will only conduct research in their areas of expertise, and only if you have trained in relevant science skills that match their expertise. 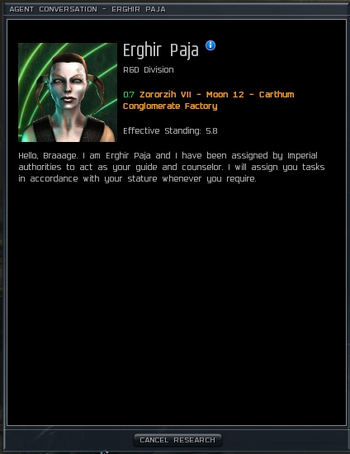 These applied science skillbooks cost 10 million ISK each - not a trivial investment. So, be sure to check the prices and market trends of various types of datacores before you choose the skills to train. Research Project Management I - Each level gives you the ability to use another agent up to a maximum of six at level V. (Beware though, this one costs 40 million). Not all non-player character (NPC) corporations offer R&D agents, so some pre-planning about which corporations you will select for your datacore farming plan is absolutely required for success. Search in The Agency in-game for R&D agents. Set the 'Specify' pull-down to 'Agents', the 'Faction' pull-down to 'Any Faction' and the 'Type' pull-down to 'R&D'. Only level 4 agents produce datacores in useful quantities. Because the good Gallente R&D agents are scattered between three corporations, they are not an optimal choice, unless you have already started grinding missions there, or are otherwise committed to their faction. To access a research agent, you must fulfill both a normal standings requirement for an agent of their Level and Quality, as well as a requirement for Corporate or Personal standings at 2.0 less than the normal standings requirement. For example, to use a Level IV research agent, your effective personal standings must be 3.00 or higher toward that agent's corporation, and you must have an effective personal standing of 5.00 or higher toward this agent, the agent's faction, or the agent's corporation, in order to use that agent's services. Note that attaining the required Corporate standing automatically fulfills the lower requirement. The extra requirement exists only to prevent those with high Faction standing from accessing top-level researchers without actually working for that corporation. Click on the "Liked By" tab. In the "Not Available to You" list, right click on a desired agent and select "Show Info" on him or her. Look under the "Agent Info" tab, and look at the "Compatibility" section at the bottom. (If there is no "Compatability" section, then you arleady have access to that agent!) It will say something like: "Your effective personal standings must be 3.00 or higher toward this agent's corporation in order to use this agent, as well as an effective personal standing of 5.00 or higher toward this agent, its faction, or its corporation in order to use this agent's services." So, if you had perfect 10.0 standings with the agent's faction and 0.0 standing with his/her corp, you couldn't use that agent. However, if you had 10.0 faction standing and 3.0 corporation standing, or if you just had 5.0 corp standing, then you could. All of this means that a certain amount of mission grinding with an R&D agent's corporation is unavoidable, but a high faction standing can reduce the amount of mission running required. Once you have the standing level needed to speak with an R&D agent, go to the station where the desired R&D agent is located, and begin a conversation with him or her. One of the options that they will provide to you is to start research - select this option. They will offer you their areas of applied science to research. Select the one(s) in which you have trained your skills. The agent will then start to produce research points (RPs) for you. Agent Skill: Determined by the Level of the agent. Level 3 agents will have Level III of the appropriate research skill. Science Skill: Determined by your training in the research skill (e.g. Quantum Physics). Negotiation Skill: Improves the effective quality of your agents. Negotiation: Directly improves the effective quality of your agent, and is the most efficient skill for raising the number of RPs you earn each day. Negotiation IV, for example, raises Effective Quality by nearly 20 points. Area Specific Skill (Mechanical Engineering, etc): Each level of your skill in this area increases the "Your Skill" part of the equation listed above. Train this skill to level 4 or higher. http://hussars-online.ru/eve/datacore.php - This site lets you input your skills, standings, and such and it'll show you in order which agents/skill combinations are the most profitable. You can use your real skills/standings, or experiment with other possible combinations to help with your planning. Once your R&D agent is working for you, that agent will offer you a special mission once per day. Each of these R&D agent missions will reward you with one day's worth or RP - effectively doubling your ISK potential. R&D agents offer relatively safe missions, half of which are short courier missions and the other half are trade-related. (Unfortunately, these R&D missions provide no faction standing increase.) There is no penalty for ignoring or declining a mission from an R&D agent, despite the warnings they may give you - turning them down will not stop their research or the flow of RPs. You can track the amount of RPs being created each day by your R&D agents by clicking on the Journal button on your NeoCom, and selecting the Research tab. This will also tell you the amount of accumulated RPs you have amassed with each agent. After ordering your datacores, transport them to a trade hub, and sell them there. Voilà - you have made ISK from datacore farming! Train Research Project Management all the way to V, so that you can access six R&D agents. Some corporations base their best Level IV R&D agents in low security space. Fly a cloaked ship, if you can, and take care in low-sec, as pirates like to hunt there! Use the Profitability of R&D Agents site to see what the current rankings are for your areas of science research focus. 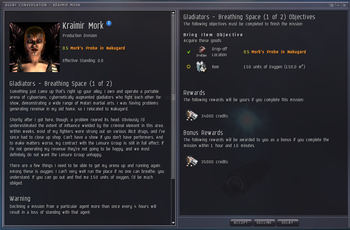 Try other sciences to see if you can make more ISK by training those and switch agents. See http://web.archive.org/web/20120423163839/http://evegeek.com/datacore.php as an additional resource. Train your Negotiation social skill to 5, to increase the payout of your R&D agents. Train your chosen applied science skills to 5, to improve the number of RPs generated by each agent researching in those skills. After increasing your Negotiation or applied science skill, you must open a conversation window with your agent to benefit from your new skill levels. Do the offered R&D missions, if you can - these will vastly increase your daily data-core production. The amount varies but can more than double your daily amount. The R&D missions vary in type: Not all are combat. Be aware some may take you into low-sec so pay close attention to the mission description. This page was last modified on 30 March 2019, at 09:43. This page has been accessed 182,334 times.